Once again, we’re running our electronic “Build-It” workshop in TOG on Saturday 15th December from 16:00 – 18:30. Many visitors to TOG tell us that they would like to get started with electronics, soldering or assembly, but they are unsure how to do so. This workshop will help. You get to build (and keep) an electronic kit. 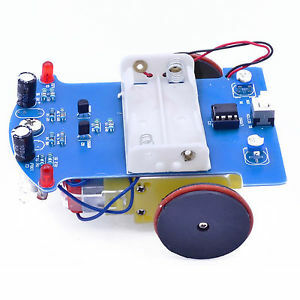 The kit that we have chosen is a line-follower robot car. It will follow a black line or any line where there is reasonable contrast. You can see a video of the kit in action, from our previous workshop here. The kit comes as a complete set of mechanical and electronic parts including a bare circuit board. You do all the electronic assembly and soldering as well as the mechanical assembly. If you’ve never built an electronics kit or soldered before, then this workshop is ideal for you. We’ll show you everything that you need to know. No previous experience at electronics, soldering or kit assembly is needed. We’ll explain the circuit and how it works too. All tools and equipment are provided. The workshop will take up to 3 hours, which is plenty of time. All proceeds from this event go to support TOG. We have 10 places available. Sign up for tickets on eventbrite. The workshop costs €25 plus booking fee. You might like to stick around afterwards for our regular Open Social evening which is happening on the same day. This was written by gary. Posted on Thursday, December 6, 2018, at 11:17 am. Filed under Workshops/Events. Bookmark the permalink. Follow comments here with the RSS feed. Post a comment or leave a trackback.